“Beyond the blue seas, and beyond the high mountains” is the stirring description which carries us to the world of Vasilissa the Beautiful and the witch Baba Yaga: perhaps the Russian equivalent of our “once upon a time” phrase. 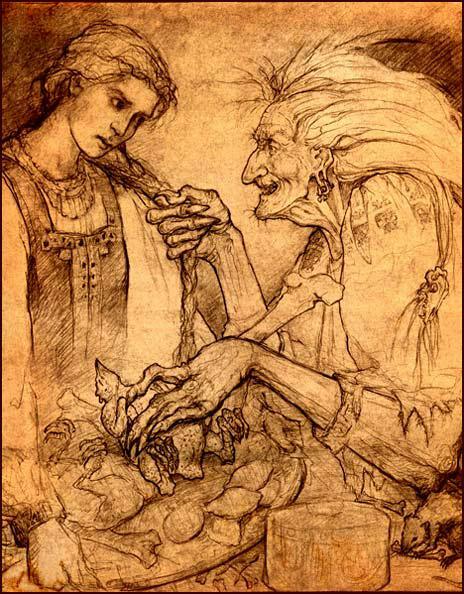 Vasilissa the Beautiful follows much the same themes as our own Cinderella: a story involving a cruel stepmother and stepsisters whose exploitive coldness must be contended with, a pure and beautiful young woman who arouses the stepmother’s jealousy, and the hag Baba Yaga. As with so many of these stories, Vasilissa’s tale endures because when we read it we sense deeper stirrings of themes to which we feel powerfully drawn. Is Baba Yaga merely a one-dimensional forest witch… or does she perhaps offer us lessons for our own lives? True to tradition, Baba Yaga is grotesquely ugly, with straggling hair as white as death and whose face seems more to be a leathery mask of wrinkles. She has at her command the powers of magical flight. The fence which borders her house is made from human bones, and upon each fence post rests a human skull with brightly-glowing eyes. The setting has all the spine-chilling attributes of a storybook evil witch, but can we really consider Baba Yaga herself to be ‘evil’? In the story she actually provides Vasilissa with the means to overcome the wicked stepmother and stepdaughters by giving her one of those fiery-eyed skulls. When Vasilissa carries the skull back to her own home, the glowing eyes burn up the tyrannical stepmother together with her daughters, and she is freed to claim back her own life. So Baba Yaga is perhaps neither strictly ‘good’ nor ‘evil’ in any clear-cut sense, any more than a tornado which destroys a community with its ferocious power can be considered as having done ‘evil’. A torrential downpour of rain might relieve a long period of drought, but the rain is not ‘good’ in any moral sense. The forces of nature simply are. Unlike the stepmother, Baba Yaga feels no jealousy towards Vasilissa’s great beauty. She cannot. To Baba Yaga, her own hideous appearance is simply a part of who she is, just as Vasilissa’s beauty reflects her pure soul. We would say that Baba Yaga owns her own ugliness. But what of Vasilissa? Her encounter with Baba Yaga has worked its own changes upon her as well. Baba Yaga has long left behind any need to feel ‘beautiful’. She is who she is. Baba Yaga’s true power has been to liberate herself from herself. In her turn, in putting up with such cruel treatment in her own home for so long, Vasilissa, by being too submissive and servile, has in a sense kept herself captive. Baba Yaga’s gift to Vasilissa has been to awaken her to her own strength. Vasilissa returns empowered. In a sense the fiery-eyed skull is a mere prop, a showy trick which distracts from what has really taken place. It is the transformed Vasilissa who does the real vanquishing, and it is the transformed Vasilissa who now is free to claim her own life back. "To liberate herself from herself." What a thoughtful turn of phrase - and what a thought-provoking reflection on this old tale. This blog post is as moving as the wonderful drawing is appropriate. Thank you, Emma.